The Scottish Transport secretary has cautioned Aberdeen Bypass contractors against “using the north-east’s enthusiasm for the road” to “apply pressure” or “cut corners” as final work is carried out on the last section of the multi-million pound project. Aberdeen Roads Limited (ARL) is nearing the end of construction on the Don Crossing, the final part of the Aberdeen Western Peripheral Route (AWPR). Physical work on the remaining four-and-a-half miles of the bypass is now finished and further examinations are due to take place in the following days before it is finally opened to the public. But last night the Scottish Government’s cabinet secretary for transport Michael Matheson told the contractors that the road must absolutely not be opened until final safety and structural examinations are concluded. And he also warned that the desire of motorists, city and regional leaders and the government to see the road opened in full could not be used as leverage by ARL. Mr Matheson said: “I would like to thank the workforce for their efforts, especially at this time of year, in often challenging conditions. More than 20 miles, or 85% of the AWPR, has already opened to the public, providing faster journeys from Stonehaven to the airport. The enormous project has, however, been faced with numerous delays since construction commenced in 2015, including the collapse of construction giant Carillion, a former member of ARL. Designed to reduce traffic congestion in Aberdeen and improve traffic flow around the city, it is due to cost £745 million. 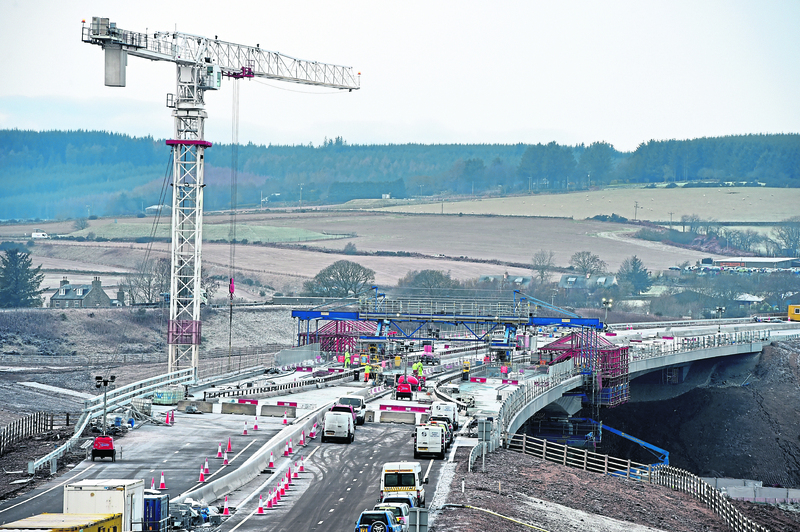 Representatives from the ARL consortium of Balfour Beatty and Galliford Try have, however, told the Scottish Parliament they will seek compensation from Transport Scotland for extra money spent on top of the original fixed contract price. Concerns have been raised that the final price tag for the entire project could be more than £1 billion if that is successful, though it is understood ARL has not yet provided sufficient evidence to the Scottish Government to substantiate its claim. Mr Matheson said the final stretch of the bypass would not open until Transport Scotland was happy that the “public purse is protected”. He added: “Taxpayers have the right to expect high standards of quality when they pay for new infrastructure from reputable international construction firms and also, to not be penalised for mistakes of these contractor’s own making. “Since it reported that more extensive remedial work was necessary on the Don Crossing in late October last year, ARL has been well aware that the technical assurances regarding the longer-term impact of these complex repairs to the bridge defects were required. “Transport Scotland continues to work constructively with ARL. “But I have been very clear and consistent that under no circumstances will the final section open until our technical experts are satisfied the public purse is protected.